By 2030, workers aged over 55 are expected to make up 30% or more of the total workforce in many EU countries. 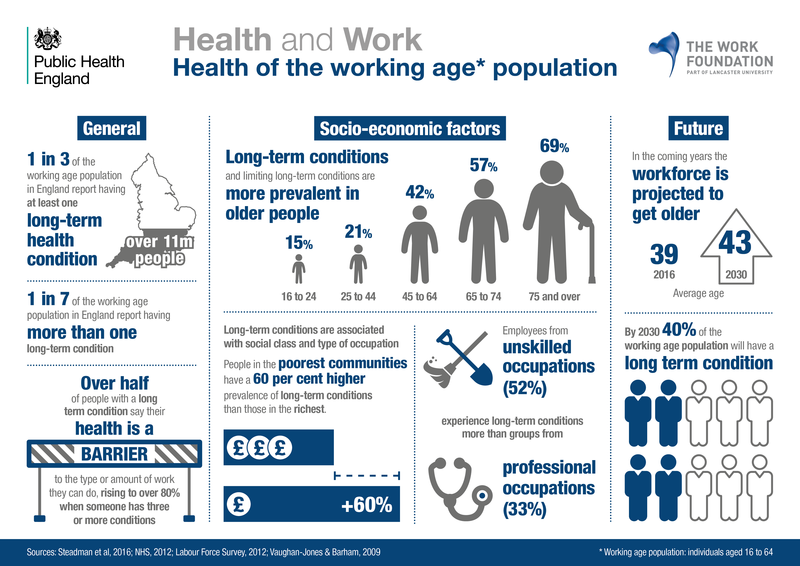 However, according to The Work Foundation, by the same year 40% of the working age population will have a long-term health condition. And over half of people with a long-term condition say their health is a barrier to the type or amount of work they can do, rising to 80% when someone has three or more conditions. Nonetheless, an EU target for employment has been set — 75% of the EU population aged 20-64 should be in employment by 2020. This creates challenges for employees, employers and businesses. Age-sensitive OSH practices and ensuring wellbeing at work throughout working life are two critical ways of achieving this target. Attracting young workers from a shrinking labour market. Retaining the growing proportion of experienced older workers. Adapting workplaces to ensure productivity. Maintaining and upgrading the overall knowledge and skills base. age diverse workforces improve overall organisational performance granting a greater ability to deal with varying roles and tasks. EU-OSHA states that being aware of differences between generations and a better understanding of ageing and the changes it implies, will help managers to make the best use of the strength and potential of all generations. Moreover, it is equally important that managers show respect, recognition and appreciation towards all age groups. In order to unlock the benefits of an age-diverse workforce, EU-OSHA says, organisations need to take a proactive approach to managing age, which might also imply a change in human resource strategies. Organisations that don't appreciate the impact of an ageing workforce and the need to address the challenges, may be putting their productivity and competitiveness at risk.